حیدری, فرشاد, رجبی, زینب. (1395). تدوین الگوی پارادایمی حکمرانی نظارتی کارا و اثربخش بر شبکه بانکی کشور. فصل‌نامه مطالعات مالی و بانکداری اسلامی, 2(بهار و تابستان), 63-93. فرشاد حیدری; زینب رجبی. "تدوین الگوی پارادایمی حکمرانی نظارتی کارا و اثربخش بر شبکه بانکی کشور". فصل‌نامه مطالعات مالی و بانکداری اسلامی, 2, بهار و تابستان, 1395, 63-93. حیدری, فرشاد, رجبی, زینب. (1395). 'تدوین الگوی پارادایمی حکمرانی نظارتی کارا و اثربخش بر شبکه بانکی کشور', فصل‌نامه مطالعات مالی و بانکداری اسلامی, 2(بهار و تابستان), pp. 63-93. حیدری, فرشاد, رجبی, زینب. تدوین الگوی پارادایمی حکمرانی نظارتی کارا و اثربخش بر شبکه بانکی کشور. فصل‌نامه مطالعات مالی و بانکداری اسلامی, 1395; 2(بهار و تابستان): 63-93. با عنایت به لزوم ارتقای مناسبات، مراودات و همکاری‌های بین‌المللی نظام بانکی کشور که پس از رفع تحریم‌ها قابل انتظار خواهد بود، ارتقای نظارت بانکی و همچنین استقرار و پیاده‌سازی آخرین استانداردها و الزامات بانکی برای فراهم شدن امکان حضور بانک‌ها و سرمایه‌گذاران خارجی در کشور و متقابلاً حضور بانک‌های کشورمان در عرصه‌های بین‌المللی بایسته می‌نماید؛ این مهم جز با تمهید شرایط قانونی، نهادی و نظارتی در حوزه بانکداری با هدف غایی ایجاد محیط کسب و کار مساعد بانکی میسر نخواهد شد. هدف از پژوهش حاضر، تدوین الگوی مفهومی برای حکمرانی نظارتی بانک مرکزی در راستای سند چشم‌انداز بیست ساله و سیاست‌های کلی اقتصاد مقاومتی می‌باشد. روش تحقیق آن مبتنی بر رویکرد کیفی است که در این پژوهش مبتنی بر راهبرد داده بنیاد است. جامعه آماری تحقیق، شامل خبرگان و متخصصان آشنا به ادبیات بانکی و نظارت بوده که با استفاده از رویکرد نمونه‌گیری هدفمند در مجموع تعداد 21 نفر انتخاب شده‌اند. در تحقیق حاضر، داده‌ها به روش مصاحبه نیمه ‌ساختار یافته گردآوری شد و سپس به روش کدگذاری برگرفته از روش نظریه پردازی داده- بنیاد با استفاده از نرم­افزار Atlasti تجزیه و تحلیل و ابعاد مدل داده بنیاد استخراجی تبیین گردید. برای به‌دست آوردن اعتبار و روایی داده‌ها از دو روش بازبینی مشارکت‌کنندگان و مرور خبرگان غیرشرکت‌کننده در پژوهش استفاده شد که از قابلیت اعتماد لازم برخوردار می‌باشد. مقوله محوری پژوهش حاضر، حکمرانی نظارتی مقاوم است که با توجه به شرایط علی، زمینه‌ای و میانجی، ابتدا ابعاد آن تبیین و راهبردهای تحقق آن تدوین شد و سپس مدل نهایی براساس آن ارایه گردید. در پایان، پیشنهاد می­شود مدل داده بنیاد حکمرانی نظارتی مقاوم مبتنی بر راهبردهای بازنگری قوانین و مقررات، تنقیح قوانین و مقررات بانکی، طراحی سیستم سیاستگذاری مالی یکپارچه، نهادینه‌سازی سیستم سیاستگذاری مالی یکپارچه، اصلاح نظام مالی، اصلاح نظام بانکی، تقویت نظارت بانکی، فرهنگ­سازی و نهادینه‌سازی نظارت بانکی با محوریت بانک مرکزی اجرا شود. 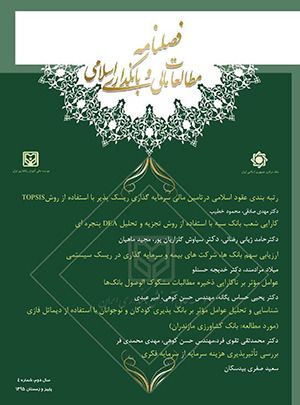 With regard to the need for improving international relations, exchanges and cooperation in the Iranian banking system after lifting the sanctions, banking supervision is expected to enhance and implement the latest banking standards and requirements so as to facilitate the engagement of foreign banks and investors in the country, which in turn would pave the way for Iranian involvement in the international arenas. This will not be realized unless legal, institutional and regulatory measures are taken within the banking system aimed at building a proper business environment. This study attempted to develop a conceptual model for regulatory governance over Central Bank of Iran in line with enforcement of the 20-Year Vision and the general policies of Resilience Economy. The methodology is based on a qualitative approach as well as Grounded Theory. The statistical population consists of 21 experts and specialists familiar with the banking and regulation literature selected through a judgemental sampling approach. In this study, data were collected using semi-structured interviews. Then, the data were analyzed through a coding technique derived from Grounded Theory using Atlasti. Finally, the dimensions of the new model were explained. The reliability and validity of the data were obtained through participant review and non-participant expert review, which were highly reliable. The core theme of this study was resilient regulatory governance, the dimensions of which were explained with regard to the causal and mediator conditions. Then, the strategies were developed and final model was presented. At the end, it was suggested that a resilient regulatory governance should be implemented through revising the laws and regulations, establishing the banking codes and regulation, designing an integrated financial policy system, institutionalizing an integrated financial policy system, reforming the banking sector, strengthening the banking supervision and expanding an appropriate banking conduct based on prescriptions of the Central Bank. Barth, James, Gerard Caprio, and Ross Levine, (2013): The Regulation and Supervision of Banks Around the World: A New Database, in Brookings-Wharton Papers on Financial Services, ed. by Robert Litan and Richard Herring (Washington: Brookings Institution Press). Dragomir, Larisa, (2010): European Prodential Banking Regulation and supervision, Routledge. Quintyn, Marc, Silvia Ramirez, and Michael Taylor, (2007): Fear of Freedom –Politicians and the Independence and Accountability of Financial Sector Supervisors, 58 References IMF Working Paper 07/25 (Washington: International Monetary Fund). Also, Chapter 3 in Designing Financial Supervision Institutions: Independence, Accountability, and Governance, eds. Donato Masciandaro and Marc Quintyn (Cheltenham, U.K.: Edward Elgar). Das, S. Udaibir, and Marc G. Quintyn (2007): Crisis Prevention and Crisis Management: The Role of Regulatory Governance, in R. Litan, M. Pomerleano and V. Sundararajan, (eds), Financial Sector Governance: the Role of the Public and Private Sectors, (Washington D.C.: Brookings Institution Press). Arnone, Marco, and Alessandro Gambini, (2007): Architectures of Financial upervisory Authorities and the Basel Core Principal, Chapter 7 in Designing Financial Supervision Institutions: Independence, Accountability, and Governance, eds. Donato Masciandaro and Marc Quintyn (Cheltenham, U.K.: Edward Elgar). قنبری، حمید: گزارش ورشکستگی موسسات مالی چرا و چگونه، انتشارات بانک مرکزی ج.ا.ا، 1392. مرکز پژوهش­‌های مجلس شورای اسلامی، دفتر مطالعات اقتصادی: سلسله گزارش­ های کارشناسی پیرامون اقتصاد مقاومتی، 1394. رجبی، زینب: گزارش تبیین الگوی کارکردی مقاوم‌سازی شبکه بانکی کشور با هدف حفظ ثبات و سلامت نظام بانکی، انتشارات بانک مرکزی ج.ا.ا، 1395. Čihák, Martin, and Richard Podpiera, (2007): Experience with Integrated Supervisors: Governance and Quality of Supervision, Chapter 8 in Designing Financial Supervision Institutions: Independence, Accountability, and Governance, ed. Harm Christian, (2007): The Governance of the Banking Firm, paper presented at the SUERF Seminar “Corporate Governance in Financial Institutions,” Nicosia, Cyprus,March 29–30, 2007. Das, S. Udaibir, Quintyn, Marc, Chenard, Kina (2009): Does Regulatory Governance Matter for Financial System Stability?, An Empirical Analysis, IMF Working Paper. Spiros G. Stavrinakis, and et.al, (2007): Corporate Governance in Financial Institutions, (four papers), ISBN 978-3-902109-39-2. Association of Supervisors of Banks of the Americas, (2015): Corporate Governance in Bank Supervisory Agencies, ASBA WORKING GROUP NO. 4. Basel Committee on Banking Supervision, (2012): Core Principles for Effective Banking Supervision, (Basel: ank for International Settlements). International Monetary Fund and World Bank, (2013): Implementation of the Basel Core Principles for Effective Banking Supervision: Experiences, Influences and Perspectives, IMF and World Bank Background Paper (Washington). بازرگان، عباس: مقدمه‌ای بر روش‌های تحقیق آمیخته و کیفی، انتشارات دیدار، تهران، 1387. دانایی­‌فرد، حسن؛ الوانی، سیدمهدی؛ آذر، عادل؛ روش‌شناسی پژوهش کیفی در مدیریت: رویکردی جامع؛ چاپ اول؛ انتشارات صفار، تهران 1393. Halme, Liisa, (2000, 2011): Bank Corporate Governance and Financial Stability, in Financial Stability and Central Banks: Selected Issues for Financial Safety Nets and Market Discipline, ed. by Liisa Halme and others (London: Centre for Central Banking Studies, Bank of England).